The short film prequel to In His Steps! 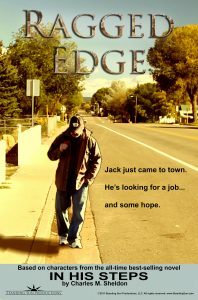 Ragged Edge tells the story of Jack Manning, one of many who have found themselves unemployed due to the difficult economic times. As he struggles to find a job to support himself and his daughter, he faces constant rejections and hardships. Eventually, after losing everything, he is forced to take to the road in search of any kind of hope… and the hope to keep living. Ragged Edge is a film that should inspire everyone to live their religion. The words of the script hurt to hear because they are true for so many of us. The cinematography is beautiful. The score is lovely. Zack Lawrence’s film makes you want to reach out in selfless love.